Regardless of where you live, choosing your windows is one of the most important decisions you'll make as you build or remodel your home. And choosing the right glass for your windows should be the most important factor in that decision. Why? Because the right glass can provide years of comfort and beauty while saving you hundreds of dollars on your energy bills. Many utility companies are now offering rebates for energy efficient window products. So make the choice that saves dollars and make sense - choose glass for your windows that require the least maintenance, and perform the best energy efficiency. Regardless of where your home is located, choosing windows that provide you with the highest level of comfort and energy savings year-round is extremely important. 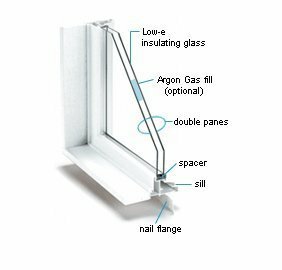 Low E3 glass provides excellent insulating capability, even better than our previous high solar gain glass, blocking heat loss to the outside and reflecting heat back into the room. Whether it is 20 below or 110 in the shade, you can bring year-round comfort to your home with Cardinal CG Company’s Low E-272® glass. In winter, Low E-272 reflects heat back into the room. In summer, it rejects the sun’s heat and damaging solar rays. Additionally, it is the clearest, highest performing glass you can buy – without haze or a bluish cast. Cardinal’s Low E-366 Glass® glass (pronounced low E cubed-366) is the ultimate performance glass. It just might make all other low-E glasses obsolete. Low E-366 Glass delivers the ideal balance of solar control and high visibility. And it provides the highest levels of year-round comfort and energy savings, making it the perfect glass no matter where you live. The secret? An unprecedented triple layer of silver. This is beyond ordinary low-E glass; Loe³-366 sets the new standard. Our Easy Clean Glass is a special dirt repelling coating (a smooth hydrophilic surface on the outside and the LoE2 on the inside #2 surface) applied to "mirror" quality glass simultaneously. Easy Clean Glass requires washing half as often and with half the effort as windows with ordinary glass.